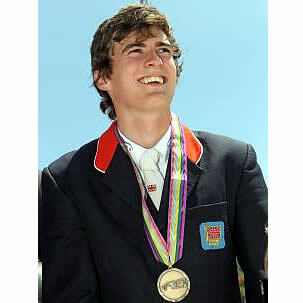 9 May 2012 – The Rolex One to Watch for May 2012 is George Whitaker (GBR). Currently based in Huddersfield, Yorkshire in Northern England, the 19-year-old jumped from 354th to 231st during May – a move up the Rolex Rankings of 123 places. George is from the most successful family in the sport of Jumping, and he forms part of the next generation of the Whitaker dynasty, along with his brother William, and cousin Ellen. His uncles, John and Michael, have been the cornerstone of the British Jumping team for the last 30 years; they both won team silver at the Los Angeles 1984 Olympic Games as well as numerous European and World Championship medals. George is part of the British Equestrian Federation’s UK Sport-funded World Class Development Programme, which works with talented riders to maximise their potential and deliver success in Dressage, Eventing and Jumping. He is also currently undergoing an apprenticeship with the intention of gaining skills in horse care and management. In July 2008, at the age of just 16, he won both the individual and team gold at the FEI European Pony Jumping Championships in Avenches (SUI), riding 10-year-old gelding, The Colour of Money. In July 2011, Whitaker made his debut at Young Rider level with the talented 11-year-old mare, Tubana, where the pair received team bronze at the European Championships in Comporta (POR). Later the same year, Whitaker achieved a double win in Austria at the CSI2* Grand Prix Salzburg Arena Messezentrum, where he also won the prize for the highest placed Under-25 rider. 2012 has seen the young rider develop his talents further, having claimed victory at the CSI2* Grand Prix Comporta (POR) and the CSI3* Grand Prix Maubeuge (FRA), both aboard Tubana. For details online featuring the Rolex Rankings please visit: www.fei.org/disciplines/jumping/rolex-rankings. June’s Rolex One to Watch will be announced at the beginning of June 2012.